Are all Jazz Masters in/of NYC? Most, yes — but can that last? My new City Arts column. See photos that demonstrate the thesis. 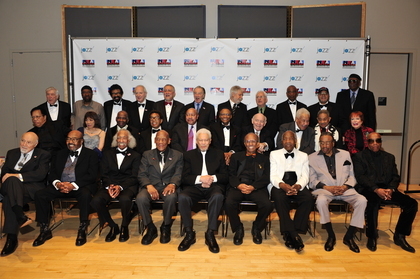 photo by Tom Pich — Assembled NEA Jazz Masters at Jazz at Lincoln Center Jan. 12 2010: from back row, l – r: Gunther Schuller, Yusef Lateef, Dan Morgenstern (NYC), Paquito D’Rivera (North Bergen NJ), Buddy DeFranco, Bill Holman, Lee Konitz (NYC), Bobby Hutcherson, Jimmy Cobb (NYC), Randy Weston (NYC); middle row: Cedar Walton (NYC), Toshiko Akiyosh (NYC), Muhal Richard Abrams (NYC), Dr. Billy Taylor, Kenny Barron (NYC), Ramsey Lewis, George Wein (NYC), Tom McIntosh, Frank Wess (NYC), Annie Ross (NYC); front row: George Avakian (NYC), James Moody, Gerald Wilson, Candido Camero (NYC), Frank Foster (NYC), Jimmy Heath (NYC), Joe Wilder (NYC), Chico Hamilton (NYC), Roy Haynes (NYC). Howard, you’re coming dangerously close to a question people don’t like asking – let alone answering. Is jazz – long ago America’s music – becoming a regional culture? I’ve long suspected that New York is less a garden of jazz and more a ghetto. There is talent coming from all over – but there’s no audience until New York stamps your ticket. A lot of my less fashionable collaborators have to leave North America to gig – but they still had to pay dues in New York, and most have to live there to get booked anywhere. Could it be that the music no longer has anything to say outside a certain set of values and assumptions that are intensely urban in nature? How did that happen? Is it not a loss to the country and the broad culture? HM: Paul, I think jazz has always been aligned with urbanity, celebrating interactions of a sort that don’t occur in rural or rustic surroundings so much as dense concentrations of people, often of different demographics, involved in the task of making pleasure part of their days (and nights). I think the music has plenty to say, still — and the question of whether NYC is a garden or a ghetto in the way you put it depends mostly on how musicians and audiences react to the changing nature of music distribution/dissemination. 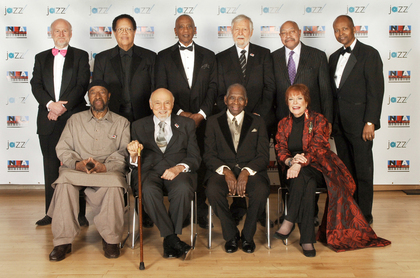 NYC does propose a high standard for jazz excellence and innovation which is less so in many other places. It is a tough school for musicians, but they leave NYC the better for having put themselves to the challenges, and the music they play wherever they end up often retains a hint of that edge that NYC hones.